Requesting that the President use the force of moral opinion to help stop lynching. May I make a very simple suggestion? According to a report of the National Association for the Advancement of Colored People, the number of American negroes lynched, or publicly murdered without trial in the past year amounts to more than one in every two days. Practically none of the murderers have been punished. There is no recourse, I believe, against this joint social agreement to violate laws except the force of moral opinion. That force is concentrated in your hands today beyond precedent. Can you not, without too great a distraction from the duties of the war, try to preserve the fruit of our former war for liberty, by sending a public rebuke, upon grounds of patriotism and the honor of democracy, to the mayor and citizens of each town in which such an atrocity occurs? In this simple way it is possible now, and it may never again be possible, to identify with the concept of American democracy a lawful respect for the lives of negroes. I urge you not to let this opportunity to defend the future of our civilization, slip into the past. 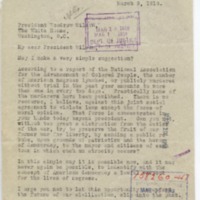 Eastman, Max, 1883-1969, “Max Eastman to Wilson,” 1918 March 9, LN31418, Race and Segregation Collection, Woodrow Wilson Presidential Library & Museum, Staunton, Virginia.